The Building News, "A Weekly Illustrated Record of The Progress of Architecture, Sculpture, Painting, Engineering, Metropolitan Improvements, Sanitary Reform, & c., &c., & c.", and published in London from January 1855. 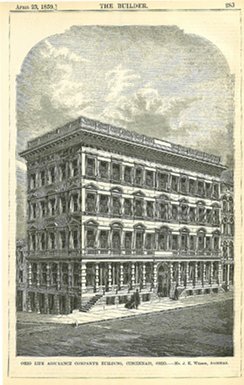 First called The Land & Building News in 1855, it was renamed The Building News on 2 January 1857 and appeared as a weekly magazine. Our digital index ends on 31 December 1914, although The Builder continued to be published up until 25 February 1966. The Building News also remained in print until 12 March 1926 when it merged with a competing London journal called The Architect, and was then renamed The Architect and Building News. This new journal continued to be published until 31 July 1968. This digital index was developed to allow users to search by any category including name of architect, name of building, by name of city, town or village, by name of client or owner, and by name of country (including countries in Europe, Asia, Africa, and North and South America). Each digital citation includes a reference to the precise weekly issue of each journal, the page number, the volume number, the length of the architectural description or critical appraisal, as well as references to any illustrated plates, either full page plates, half page plates, or engravings or half tone photographs within the body of the text. ADDENDA No. 1: As of January 2012, we have added architectural citations found from the monthly journal called The Civil Engineer and Architect's Journal. This journal was published in London from October 1837 (Vol. 1) to May 1868 (Vol. 31). ADDENDA No. 2: As of October 2013, we have added architectural citations from the monthly journal called The Architect - A Weekly Illustrated Journal of Art, Civil Engineering and Building. This journal was published in London from January 1869 (Vol. 1) to January 1893 (Vol. 49) when the name was changed to The Architect & Contract Reporter, and it continued to be published until 1918, at which time it reverted to its former name The Architect This journal continued to be published until 1926.